Help the environment with a practical eco-friendly pen made of 59% manufactured waste! The Custom Bic Eco Pens with Logo are durable, practical as a business gift and can be totally personalised just the way you like it. You're sure to see an increase on sales and generate more business leads. 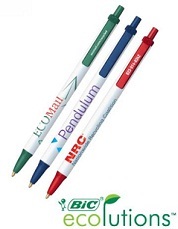 For a FREE QUOTE, please fill in the form regarding our Custom Bic Eco Pens with Logo and we'll be able to help you. Why not have a look a our Promotional gifts department for more excellent promotional gifts.